Creating your niche in today’s crowded chamber music world is not an easy task. However with talent, hard work and a bit of creative ingenuity many young chamber music ensembles are finding their place in that world and winning over skeptical presenters and audiences. 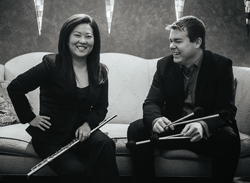 On Monday, March 10 at Kent State University and Thursday, March 13 at the Oberlin Conservatory, the bi-coastal A/B Duo, comprised of percussionist Christopher G. Jones (Rochester, NY) and flutist Meerenai Shim (Campbell, CA), will present concerts that feature a variety of fun, intense and thought-provoking new works, most of which have been written for A/B Duo. The concerts will include Matthew Joseph Payne’s Echoloquacious for flute, percussion and Gameboy/LSDJ, Ivan Trevino’s Things We Dream About for flute, bass flute, vibraphone and drums, Carolyn O’Brien’s Nocturne for contrabass flute and djembe and the premiere of Zack Browning’s Sol Moon Rocker for flute and vibraphone. If seeing is believing, check out A/B’s video of “Fun” from Things We Dream About. On Wednesday, March 12 beginning at 2:00 pm Christopher Jones and Meerenai Shim will have an opportunity to work on that elevator speech when they present a workshop titled Making Contemporary Music at Kendal at Oberlin. The brainchild of new music aficionados and Kendal residents Larry and Arlene Dunn, the workshop will give the public an opportunity to learn more about how musicians go about asking composers to write pieces, and about the collaborative process between composers and performers. “It’s going to be a little bit of a show-and-tell, said Shim. “We’ll play excerpts from our program and discuss how we interpret what composers write.